Amazon is basically Walmart. I know we probably all know this on an emotional level but don’t actually say it, the same way we didn’t say it about Target for a long time, or how we don’t say it about places like Ikea. It seems like now that Amazon is bullying publishers the same class of people that hate Walmart are starting to hate on Amazon, at least on the fulfillment side of things. Amazon Web Services have of course devoured much of the “cloud” business. When there’s an Amazon outage now, most of the internet seems affected in one way or another. Images don’t load on 2/3 of the websites you visit. Etc. Today I had to make some changes to an Amazon Cloudfront distribution. Cloudfront is Amazon’s CDN service which places content around the world on servers at strategic places (“edge servers”) so it can get to you faster, identical to the way they place warehouses closer to where most people are to get goods to them faster. After I made the changes, I had to invalidate some of the currently cached objects so that new versions would be sent out to the edge servers. You can invalidate a specified number of objects each month for free. Above that limit, you pay a fee for each object that you invalidate. For example, to invalidate a directory and all of the files in the directory, you must invalidate the directory and each file individually. If you need to invalidate a lot of files, it might be easier and less expensive to create a new distribution and change your object paths to refer to the new distribution. For more information about the charges for invalidation, see Paying for Object Invalidation. I clicked through to the link, but it wasn’t clear there how much invalidations are. Amazon has something they call the “Simple Monthly Calculator” which isn’t simple anymore but they still call it that. I plugged my numbers in and the first 1000 cache invalidations are free, and they’re $5 per 1000 after that. Seems pricey. I guess push is more expensive than pull. Blah blah, doesn’t matter. I see on the calculator that they have a “pricing philosophy” page. 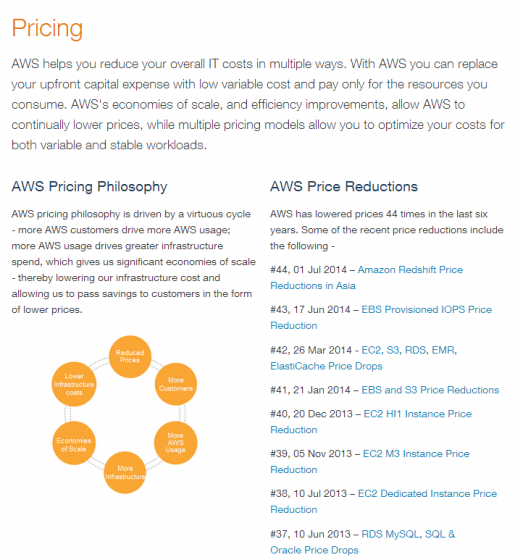 “AWS pricing philosophy is driven by a virtuous cycle.” Their cycle is identical to Walmart’s. Look how proud they are about their price reductions and low price, so proud they lead with it the same way Walmart lead with Always Low Prices for years and years until they did their PR makeover. If one believes that Walmart is evil (this is the constant Walmart rhetoric), and Amazon’s store side is evil, then wouldn’t AWS also be evil? It’s the same philosophy and will likely end with the same result. The warehouses will all have robots to put fulfillment people out of work, and software at AWS will put more technical people out of work. Isn’t this “worse” in the Amazon situation, as many more people won’t even be working at all, much less “exploited” at minimum wage? Sad aside: On the fulfillment side of things, you don’t even leave your house to shop at Amazon, so we won’t even get a “People of Amazon” site (see People of Walmart) where we can laugh at the people that are beneath us that go to Amazon because no one “goes” to Amazon. Buy hey, I work on the software services side of things, and I’ve never seen anyone write about how AWS is problematic the same way people write about Walmart. Is it because the people that are being put out of work via this philosophy have much higher wages at the moment? I’ve seen like one article talking about it on the store/fulfillment end of things, zero on the services. Yet the writing is clearly on the wall. Note that I’m not taking any side here or saying what either company is doing is wrong in any way, I’m just curious why the same rhetoric about Walmart isn’t applied to Amazon. They’re both fundamentally just logistics companies, with the same business philosophy, and they will both have the same effects in the long run.